Bear is cute and cuddly like a teddy bear. He’s very sweet and friendly to everybody he meets. It’s harder than you think to take non-blurry photos of him because he’s almost always on the move; he rarely sits still when he’s awake. He rides well in a car and walks well on a leash. He’s not much of a barker, just when there are squirrels outside of his window. He loves food and gets really excited whenever somebody is eating or making food or taking something out of the fridge. He’s not ashamed to stare at you or paw at you, in hopes that you will share. In addition to food, he loves cuddles. Because he’s quite food-motivated, he’ll probably do anything for food. 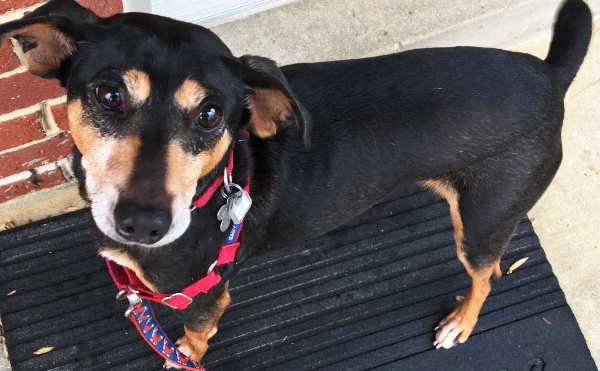 We’re not sure if anybody’s ever tried to teach him to sit or shake a paw before (he didn’t appear to recognize these commands the first night of his dogventure), but he caught on pretty quickly when he was rewarded with kibble and cuddles (see video). With the exception of marking a few items in the house, he appears to be house-trained.